Steel Hoe (Powrah ) meets the quality standard as set by the Bureau Of Indian Standards (BIS) 1759-1986 Specification of “POWRAH”as approved by the Govt. of India. These Steel Products are available under the brand name and logo namely “AGRO” (Crocodile) and “BULLDOG” that enjoy excellent reputation in the country. Over the years, by serving the clients with satisfaction, we have emerged as a House of trusted agricultural Handtool /Equipment Manufacturers and Supplier’s in India. Backed by our skilled team of employees, we manufacture high-grade Steel Hoe. These Steel Hoes are available in various sizes and specifications that allow us to cater to the diverse requirements of the clients. The Steel Hoe, fabricated by us is manufactured using high-grade steel that make us ensure high quality to the clients. The clients can avail the Steel Hoe from at the market leading price. What Makes Our Steel Hoe Special? All Steel Hoes or Powrahs are made from Rail Steel cuttings procured from Bhilai Steel Plant and used Rails from Indian Railways. The said Rail steel passes through various cutting and shearing process and after which the designated Powrahs are rolled and forged in one piece through our in-house manufacturing process. Since rail steel is used as medium of steel the quality is 100 % assured as to its durability and longevity and toughness with high percentage of carbon content of 0.5 to 0.7 % Carbon and high Manganese (1 % approx. )For longer wear and tear. 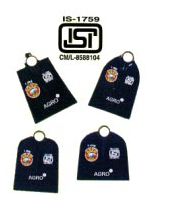 Agri No 4 - 1.4 Kg. Agri No.5 - 1.5 Kg. Agri No.6 - 1.8 Kg. West India - 1.6 Kg. East India - 1.8 Kg. Bombay Type - 1.2 Kg. Bombay Type - 1.4 Kg. Swan Neck - 1.4 Kg. Swan Neck - 1.8 Kg. Lanka Hoe - 1.250 Kg. Mysore Mamooty - 1.6 Kg.